Last month I shared my Vision Mandala with you and that I am expecting a birth! The images on my mandala showed me! Watch for my new designs on silk and new ways of sharing my creativity. I’ve also been communicating with the panther in the center and have learned that I’m ready to come into even more of my true feminine power as a woman and entrepreneur this year! On January 29th, I facilitated a workshop where 6 powerful women made their Vision Mandalas. (I gave you the supply list and directions for making your mandala last month.) The second part (after we made the mandalas) was a moving experience as each woman shared their experience and what they saw as they dialogued with their images. How did you feel while you were making the mandala? What is in the middle that represents the center of your vision and where you are now or who you are? What’s at the bottom that represents the foundation that you are building on? What’s at the top, which represents what you are striving for? Gaze at your mandala for about 5 minutes. Ask it to speak to you and to let you know what their message to you is. What are the qualities of this image? Do you have any other questions to ask it? Write these messages down on the back of your mandala so you’ll have them as the year progresses and you can see how your life is unfolding according to this vision! Ask another person or two to look at your mandala and write their impressions of it in words or phrases without speaking to you. What are you expecting in 2012? 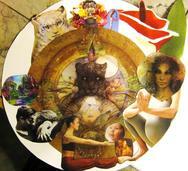 See artist and educator, Laurie Marshall’s beautiful Vision Collage for 2012 posted on my FaceBook page! Thanks for sharing Laurie! I’ve added photos of the 6 Vision Mandalas from our workshop. Check them out! They are awesome!